Thanksgiving turkey meal would be incomplete, without some delicious homemade cranberry sauce. 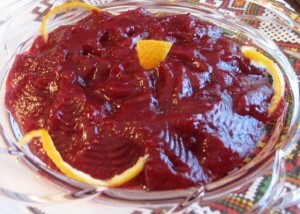 If you always use the canned cranberry sauce, because you think that making your own is too difficult, think again. Cranberry sauce is so easy to prepare, your under 10-year-old children can do it, honestly. And best of all, it tastes so fresh, and absolutely delicious. You will never use the other kind again. This recipe yields 2.5 -3 cups of sauce. In a medium saucepan, add the orange juice, cranberry juice, shredded apple and orange zest. Bring to boil, and cook 5 minutes. Add the cranberries, bring to boil again, partially cover the pot, and simmer on low heat for another 10 minutes, stirring occasionally,until the berries burst. Add the brown sugar, cinnamon and cloves. Remove from heat, stir in the honey, and let it cool off. You can puree the sauce in a food processor, or leave it as is. Transfer into a covered storage container, and keep refrigerated until ready to use. It may be prepared several days ahead.